Snapdeal, India’s largest online marketplace on Wednesday unveiled an exclusive automobile platform- Snapdeal Motors that offers its customers an integrated buying experience enabling online booking along with loan approvals within 2 minutes of the vehicle purchase. The platform allows customers to connect with dealers on the basis of their location and estimated delivery date. Consumers will have to pay a nominal booking amount. They can do a test drive or get the product delivered at their doorstep. Hero MotoCorp and Piaggio are available on this platform at launch and automobiles from Mahindra, Suzuki Motorcycles and Datsun will be available soon. “Snapdeal was the first online marketplace to introduce the Automobile category and we have witnessed tremendous growth with over 300,000 bikes sold since launch basis our successful partnership with Hero Moto Corp and others”, said Senior Vice President, Partnerships and Strategic initiatives, Tony Navin. ”With the introduction of the Snapdeal Motors, we are aiming to take this to the next level and provide our customers a holistic buying experience marrying online and offline retail channels. This is going to be a very strong platform that we believe should clock over $2 billion in sales over the next two years”, he added. Snapdeal Motors will be available through web, mobile and app platforms. 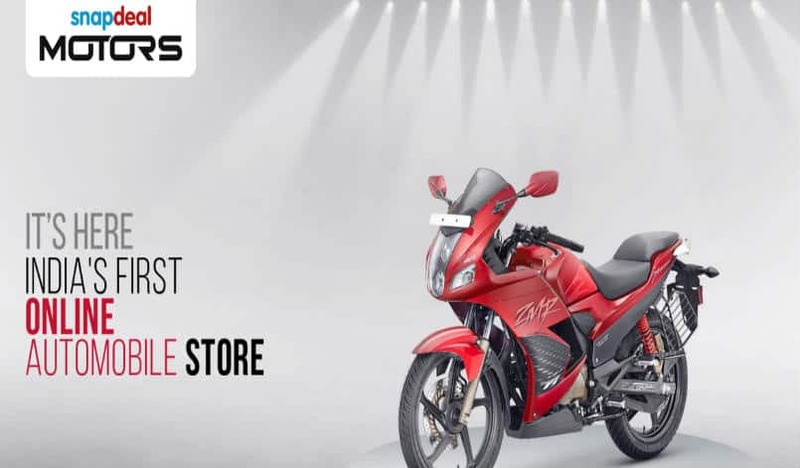 Snapdeal Motors allows price transparency, color choices, check on-road price and even pay a nominal booking amount from the platform itself and easy delivery through dedicated dealers. Snapdeal Motors users can book automobiles and get assistance for instant loans through Snapdeal’s finance platform RupeePower. The company says it will introduce ‘Test Drive at Home’ and ‘Door Step Delivery’ option in the coming weeks.